More than twenty-four hours have passed since I submitted a comment to the Templeton Foundation’s online debate over the question, “Does the free market corrode moral character?” Though my tone was mildly caustic, my question was very much in earnest: Is the Templeton Foundation itself corroding moral character by renting the glamour and prestige of public intellectuals, in light of the $1.1 million given by the foundation’s chairman, John Templeton, Jr., to the recent successful campaign in California to take away from gays and lesbians the right to marry? The Templeton’s website warns “Comments will be edited for clarity and length.” It says nothing about censorship. However, as of Saturday morning, my comment, submitted on Thursday, hasn’t been posted, though several comments posted on Friday by others have been. This suggests to me that the Templeton Foundation’s pretensions to belief in the free exchange of ideas are fraudulent. And John Templeton, Jr.’s support of the Yes on Proposition 8 campaign suggests to me that the foundation he runs is willing to blur the line between church and state in order to deprive a minority of the civil right of marriage. Until the Templeton Foundation addresses the issue of its chairman’s antagonism to gay civil rights, either by dismissing him or by issuing an apology, backed by equivalent funding to a group advocating gay civil marriage, I strongly discourage writers and intellectuals who believe in the free exchange of ideas, the separation of church and state, gay rights, or the protection of the civil rights of minorities from working with or accepting money from the Templeton Foundation. A number of intellectuals and writers have already accepted money from Templeton, an organization that lobbies for the idea that science and religion can mix. Upon receiving an invitation to write an essay for Templeton for a fee, some of the liberal intellectuals among them may have had qualms, but they were promised editorial freedom, and they seem to have gotten it. (The essays were subsequently turned into ads for Templeton, which were published in The New York Times, The New Yorker, The New Republic, and elsewhere.) The trouble is not in the words that the intellectuals wrote for Templeton, but in those words’ illocutionary effect, to borrow a term from linguistics. Even if their words contradict the stated or implicit goals of the Templeton Foundation in their essays, their willingness to collaborate signals that they consider the Templeton Foundation a decent enough member of the intellectual community to do business with. Many of the intellectuals are celebrated figures, who are no doubt asked to write many more essays and make many more statements than they can afford to, if they are to continue your more serious labors. Their consent therefore also signals that the Templeton Foundation is worth a pause in their labors. By consenting to write for Templeton, they loan the foundation some of their glamour and prestige. John Templeton, Jr.’s support for Proposition 8 was only reported recently, and there’s no way that the intellectuals who wrote for it previously could have known about it. They get a pass, in my opinion (though if I were one of them, I would feel obliged to speak out about Templeton’s attack on gay marriage, to prove that when Templeton bought my words he didn’t also buy my silence). But it’s in the public record now, and I don’t think that intellectuals who think of themselves as liberal or progressive should collaborate with the group in the future, unless it corrects its course. Such a boycott would apply considerable pressure to the Templeton Foundation, whose gifts and prizes seem designed to collect intellectual prestige on behalf of its campaign to fuse scientific and religious issues. The sooner that John Templeton, Jr., is forced to recognize that his bigotry threatens to undermine his late father’s legacy, the better. Hear, hear, Caleb! 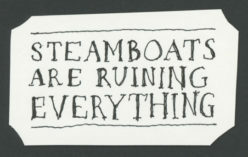 It's not steamboats that are ruining everything, but Templetons!